“For months, I have traveled the commonwealth and joined Democrats and Republicans, as well as medical professionals, law enforcement, first responders, and other community leaders to discuss ways we can battle the opioid epidemic. Four weeks ago, I addressed a joint session of the General Assembly to outline a set of shared, specific legislative goals that would help us tackle this public health crisis. Together with Republicans and Democrats in both the House and Senate, we made a commitment to prioritize helping the victims of substance use disorder and the communities that have been devastated by this terrible disease. “Today, I applaud the legislature for working with me to pass a package of bills that allows us to take another important step in fighting this issue that plagues all of our communities. 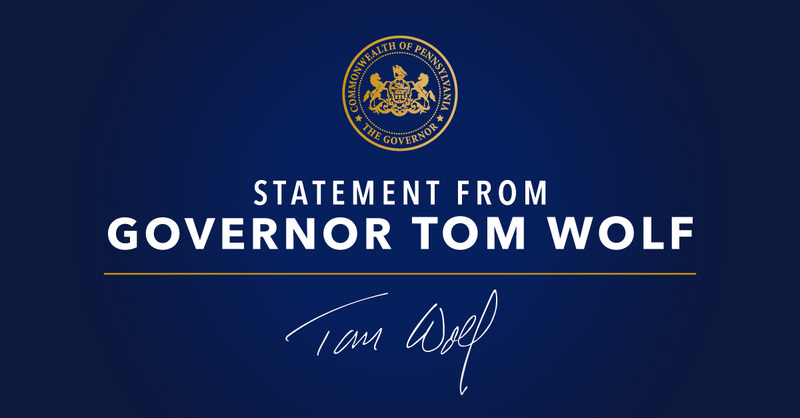 I would also like to thank groups like the Hospital and Healthsystem Association of Pennsylvania, the Pennsylvania Association of Chain Drug Stores, and the Pennsylvania Pharmacists Association for all of their work on these important bills. “We still have more to do, but working together we have now accomplished strengthening the Prescription Drug Monitoring Program, restricting the number of pills that can be prescribed to minors or in emergency rooms, establishing education curriculum on safe prescribing, and creating more locations for the drop-off of drugs among other important initiatives. “My administration is also working on implementing opioid treatment centers across the state that will help more than 11,000 individuals. Additionally, I will continue to work on ensuring doctors, prescribers and pharmacists are registered for and properly utilizing the Prescription Drug Monitoring Program, educating the public on the availability of naloxone, and executing the warm hand-off policy that helps individuals receive treatment. SB1367 (Yaw): This bill amends Title 35 (Health and Safety) to establish restrictions on physicians’ ability to prescribe opioids to minors, including limiting prescriptions to seven days and requiring physicians to take a number of steps before issuing the first prescription in a single course of treatment. This bill passed unanimously in the Senate on 9/28/16. SB1368 (Killion): This bill establishes a safe opioid prescribing curriculum in medical colleges and other medical training facilities offering or desiring to offer medical training. The curriculum must include: current, age-appropriate information relating to pain management; alternatives to opioid pain medications; instructions on safe prescribing methods in the event opioids must be prescribed; identification of patients who are at risk for addiction; and, training on managing substance use disorders as chronic diseases. SB1202 (Yaw): This bill amends the Achieving Better Care by Monitoring All Prescriptions Program (ABC-MAP) Act requires continuing education in pain management, addiction and dispensing for prescribers and dispensers. The Governor’s Office successfully passed an amendment that would require prescribers to check the ABC-MAP every time they prescribe an opioid or benzodiazepine. In addition, the Administration’s amendment would require dispensers to input prescription data to the ABC-MAP within 24 hours of dispensing. Current law gives dispensers (who are required to enter information into the ABC-MAP when they dispense an opioid or other controlled substance) 72 hours to log in and enter information. HB1699 (Brown): This bill mandates that hospital emergency departments and urgent care centers may not prescribe opioids in quantities that last more than seven days and they may not write refills for opioid prescriptions. HB 1737 (Maher): This bill would allow all federal, state and local law enforcement entities, hospitals, assisted living facilities, home health care agencies, long-term care nursing facilities, hospice, and commonwealth licensed pharmacies to serve as drop-off locations for any extra, unwanted, or expired prescription drugs or over-the-counter pharmaceutical products.